At the risk of offending a number of readers with this post, I’m just going to come out the worst news ever: I stepped on the scales the other day, and I’ve lost 2 kilos. Devastating, isn’t it? So the backstory is, I gave up meat and alcohol for Lent, and my body is paying the price. So much for building muscle mass. So much for intense weight lifting in 36 degree heat without air con. So much for protein powders and pre-workouts. So much for bulking. What’s it all for if I’m losing weight? The silver lining to my #firstworldproblems is Sunday. A day to break the Lenten fast, also known as “cheat day” the rest of the year. And what better way to do so at The Hub House Diner in Dulwich Hill. What was I craving? Half a chargrilled chicken basted with hickory smoked BBQ sauce, and a cold beer. 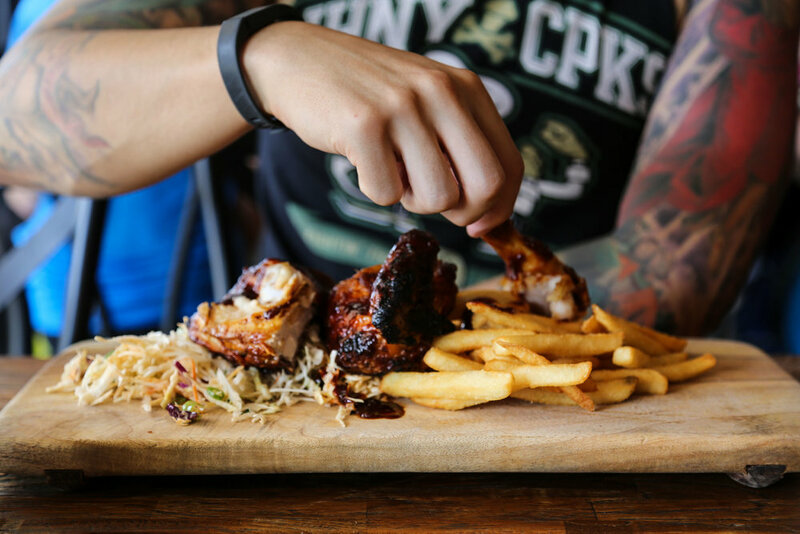 There’s little else to say… perfectly cooked chicken, delicious sauce, wholesome slaw and fries the size of my fingers. If only everyday was cheat day.